This ref. 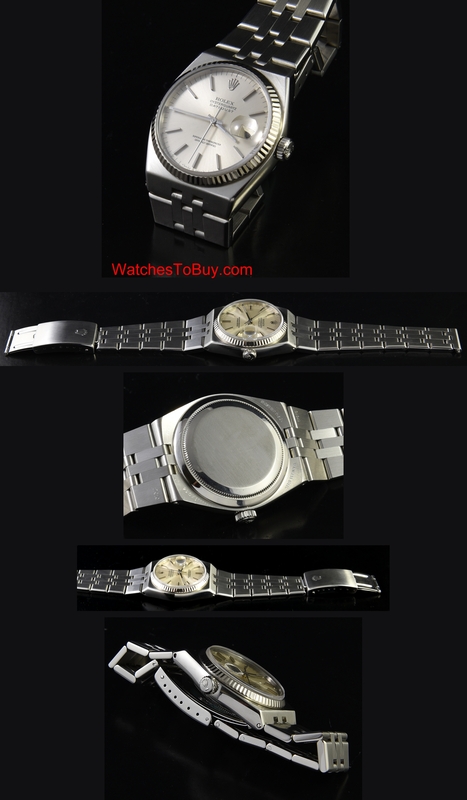 17014 vintage ROLEX OYSTER QUARTZ DATEJUST displays amazing condition overall. This reference is a more uncommon version than the ref. 17000 version, which has the smooth bezel and different bracelet. This watch was about $525 more than the ref. 17000 when new-$3575. It is great to place an OYSTERQUARTZ on the wrist, without having to wind or set it. The 36.5mm. stainless steel case and bracelet are very clean after a recent overhaul. The sapphire crystal and wide fluted solid white gold 14k. bezel look perfect. The silver dial is pristine. This watch has a quickset date feature for ease of setting. ROLEX was known to manufacture these watches with the highest tolerances; in fact, the OYSTERQUARTZ was built to the highest tolerances of ALL watches ROLEX made in this era. The electronic, quartz movement in this watch is VERY finely finished and considered to be the best QUARTZ movement ever produced. 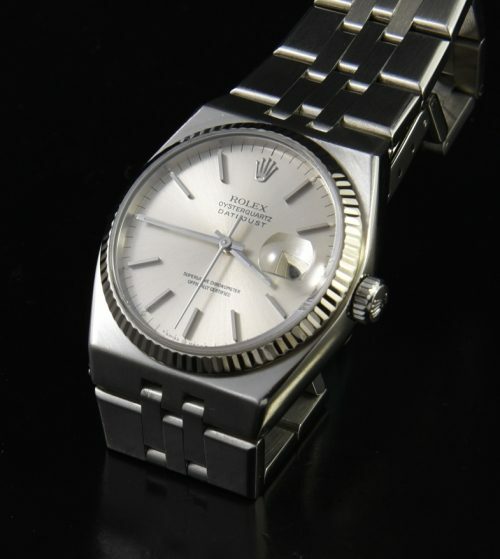 Only the ROLEX manual winding 1530, which preceded this watch for a VERY short time, utilized this SAME case and bracelet. I have rarely found an overly stretched bracelet on an OYSTERQUARTZ, as they are built so finely. We wear an OYSTERQUARTZ often, because they have such a sleek, modern look, are larger than most vintage ROLEX (other than the sports models in the same era) and are very accurate. It is estimated that only 25,000 of these special ROLEX watches were produced worldwide, further adding to their cult status and desirability. This battery operated watch is ticking away very accurately.